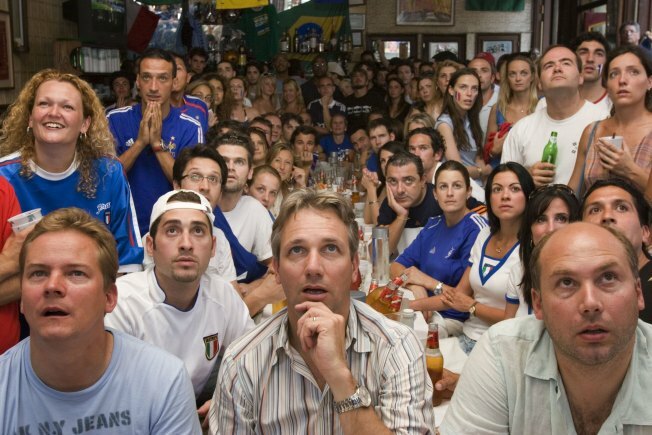 Soccer fans react while watching the 2006 World Cup final between Italy and France at Felix in the Manhattan, New York City. Italy won 5-3 in a shoot out after a 1-1 draw. What's the best part about The World Cup? Well, here in New York, bars are flinging open their doors as early as 9 a.m. to attract all those soccer (sorry, football) fanatics. And with drink and food specials like these, even non-fans might consider calling in sick and pulling up a bar stool. And down at Double Crown on Bowery, the 9:30 a.m opening will be accompanied by a do-it-yourself Bloody Mary bar and specials on pitchers of mojitos and beer will surely keep the party going all day. They too created some special sports-bar style menu items for the Cup like fish and chips and a crispy skate sandwich. Italian fans will likely flock to Trattoria Cinque in Tribeca (where Puma held its uniform reveal party in March) for flat bread pizzas and Peronis on tap, where the screens are visible from both the bar and the restaurant area and the forza Italia will be in full forza. For las Espanas (that is, the Spanish faithful), Boqueria was thoughtful enough to post a schedule of the games and will be showing every single one at both locations (Flat Iron and SoHo) on two screens beginning at 9:30 a.m. (7:30 a.m. games will show at Noon) and early birds will be treated to a free order of either churros with chocolate or bravas and beer during the first week. Their World Cup menu also includes sandwiches like egg and chorizo and their signature tapas. For you West Villagers, Scuderia is a favorite place to watch the games even on non-Cup years. So, while they aren't advertising any specials, they will be showing "all games, all the time," and the manager promises "the bartenders will do something... they'll take care of you. Don't worry about it."